ABILENE,Texas (KTAB) - "You get to meet all kinds of people working in this industry," says Veronica Fisher, the manager at Super 8 in Abilene. It's one of the reasons why Veronica Fisher and her husband, Jason Timms got into the hotel business. Each time someone checks in, a new adventure awaits. "I believe God sent us here. God sends you where you need to be to get help," says Joseph Stewart, a guest at the Super 8. 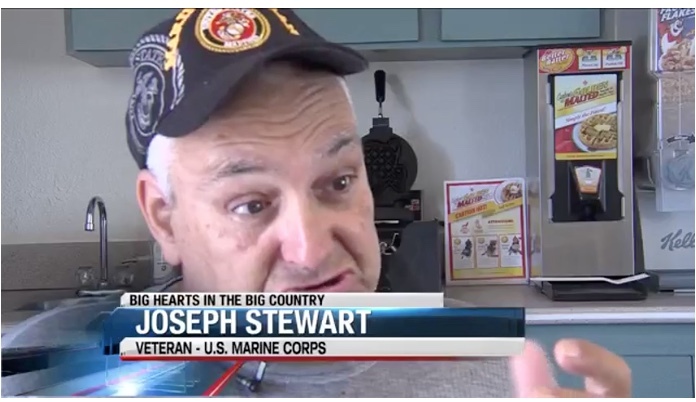 Joseph Stewart, served in the United States Marine Corps and has lived a life of service, ministering to others. Jason Timms, an employee of the hotel says, "He was having a rough time." Stewart adds, "After we got here, I got low on funds." "When I heard his story, and with him being a veteran, I feel like if you fought for my country, you need the help," Timms adds.